The French Atlantic coast is undeniably the epicentre of French sailing culture, there can´t be any doubts. Down from Bordeaux with CNB up all over to La Rochelle with Dufour, Alubat or RM-Yachts, Beneteau in and around St. Gilles Croix de Vie all along with Jeanneau Yachts and to the North with some smaller workshops like Pogo Structures and – you guessed it – JPK Yachts, the French Atlantic Coast is the Mecca for yacht aficionados for sure. JPK Yachts may not be the biggest name in this ballet of brands, but for sure a very selected one with a very, very special sound to it. Jean Pierre Kelbert is a hell of a personality. This man embodies like nobody else I´ve ever visited the realization of his dreams. He is a self-made man, a maker. An aura surrounds him, he is radiating confidence and competence. By that, he is a very, very friendly man who instantly gets your attention and affection. All he says is interesting, I´ve rarely met a man who was so kind and strong at the same time. He is so kind, so welcoming and seemingly proud of his yard, I am allowed to ask every question I can think of, I can look behind every corner and open every door I want. Jean-Pierre Kelbert is a former windsurfing champion. He is a child of the Sea as to say and has been out on the waves ever since. European Champion in windsurfing back in 1988 and 1999, he has produced his own windsurfing boards and equipment every since. 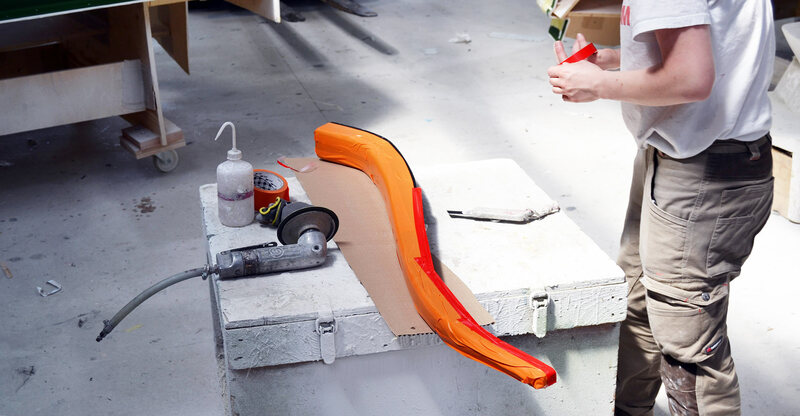 Working with Epoxy, GRP, infusion techniques and lightweight yet stiff materials was a matter of course for Jean-Pierre all through his life as a top sportsman. 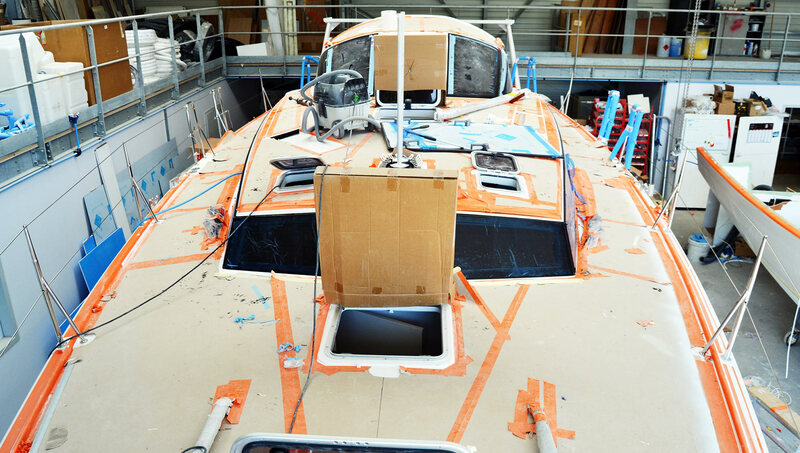 When he grew older his interest in monohull sailing awoke and when he finally paired with Jaques Valer, still the principal naval architect of every JPK yacht, the exciting story of JPK boats began. What makes a sailing yacht by JPK so special? 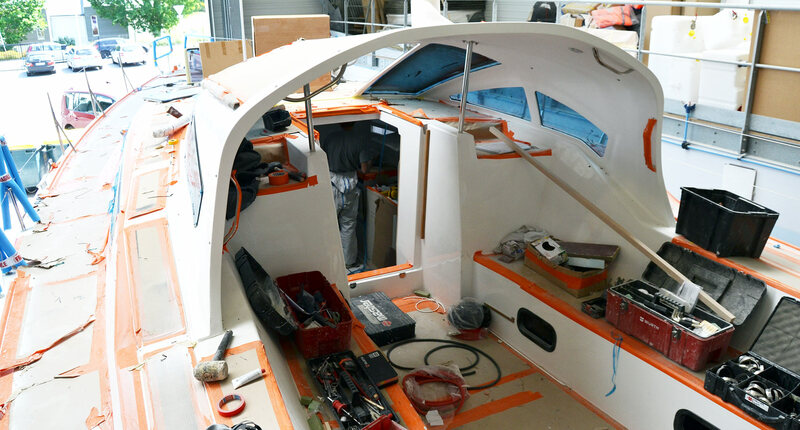 Jean-Pierre started JPK Yachts back in 2002 and his boats are since then known as being among the best “small” boats you can possibly acquire: There is seldom a race where a JPK isn´t among the first if not the it itself: Transatlantic races, Fastnet, Middle Sea race and so on. Being on a JPK seems to be the recipe for winning, no matter under which conditions and where the boat is raced, a JPK seems to be faster arriving at the finish than others. But why is that? 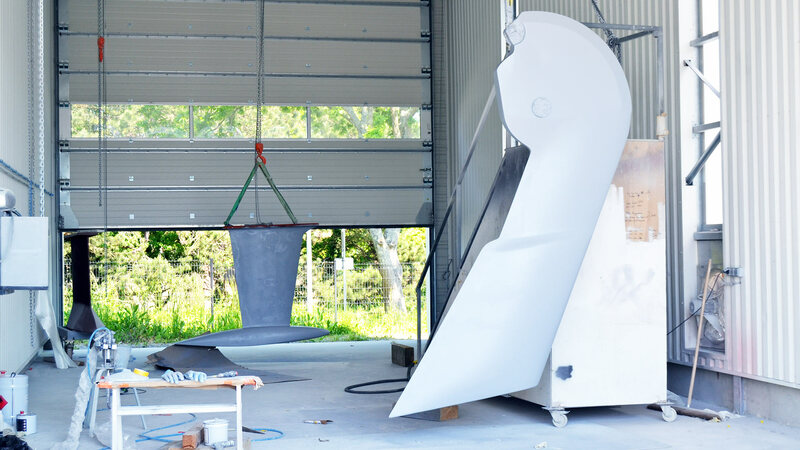 Leightweight built, stiff and fast composite sailing yacht hulls – JPK! Jean-Pierre, as with every yard visit, starts to show us around at the moulds where the hulls are made. 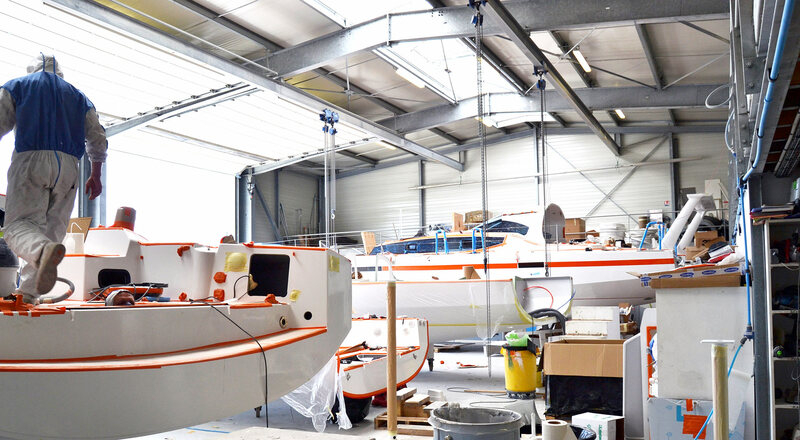 Currently the yard is busy in producing the bigger boats of the line, the all-new JPK 45 fast cruiser and 10.80, 11.80 for the fast daysailers. 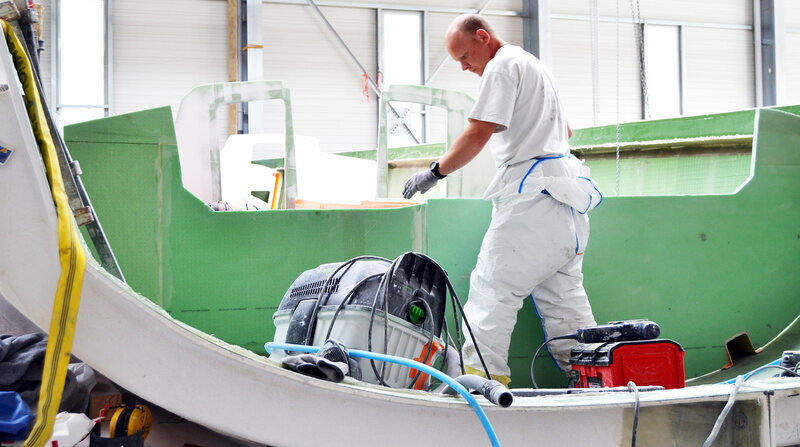 All hulls are vacuum infused with foam core sandwich. 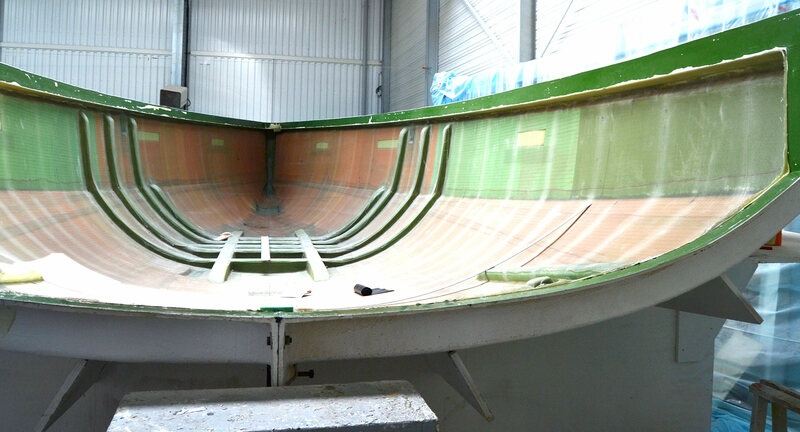 Stringers and longitudinal stiffeners are laminated to the hull (there is no inner shell) and as far as I could observe from looking at a brand new JPK 45 hull in the mould, the utilize different types of foam core materials at different locations in the hull itself. 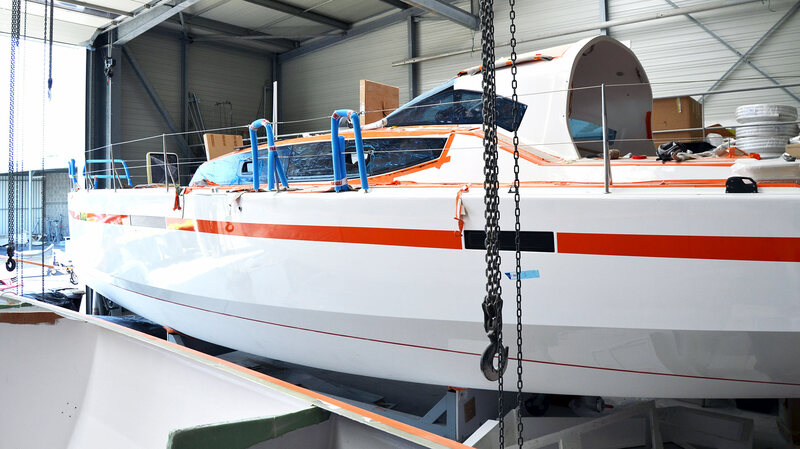 There is the secret: The yard is calles “JPK Composites” for a purpose, not “JPK Yachts” or alike: He sees himself as a specialist for utilizing composite materials for achieving light and stiff products. Jean-Pierre of course doesn´t reveal too many of his “secrets” but he tells me that the main objective of his work and his company is the constant search for the best formula to creating light, stiff, durable and strong compositions of then different materials to get out the best product possible. The success of JPK yachts out in the racing course prove he´s doing right. At JPK they are making everything by themselves if possible. Saving weight by achieving the best outcome in strength is main objective. I can observe two workers who are making the tillers for the steering system of another new JPK boat. 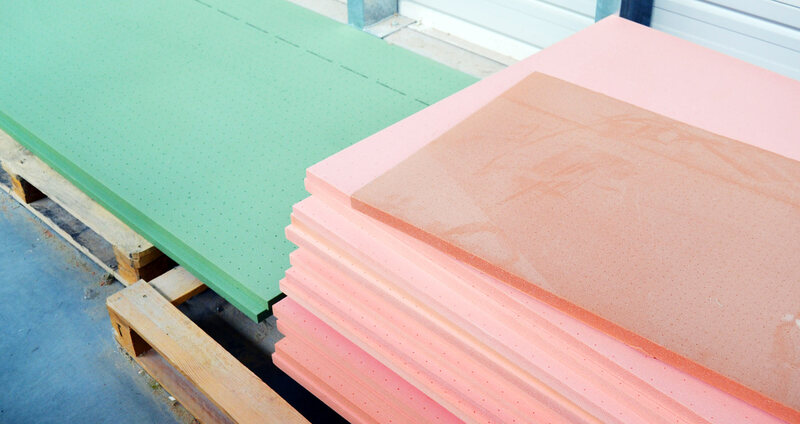 One is preparing multiple layers of different woven glass fibre garments by putting them diligently into a mould, the other is preparing the mixture of resin and hardener. A working station further on another worker is putting the bright protective tape all over a readily finished (carbon made?) tiller that is going to be mounted to one of the boats in build soon. Incredible! Some 25 people people are working at JPK Composites, as Jean-Pierre tells me, and every single one I meet during my yard visit is briefly interrupting his or her work and smiles at me: “Bonjour Monsieur!”, they are all greeting me and stand in pride before their work. Every single man and woman working here seems to invite me to step on and take a look at his work: No one has a problem in getting photographed. Pride for what they do – that´s the common feeling I can sense amongst the people at JPK. And this is instilling such a vast amount of confidence in the product! 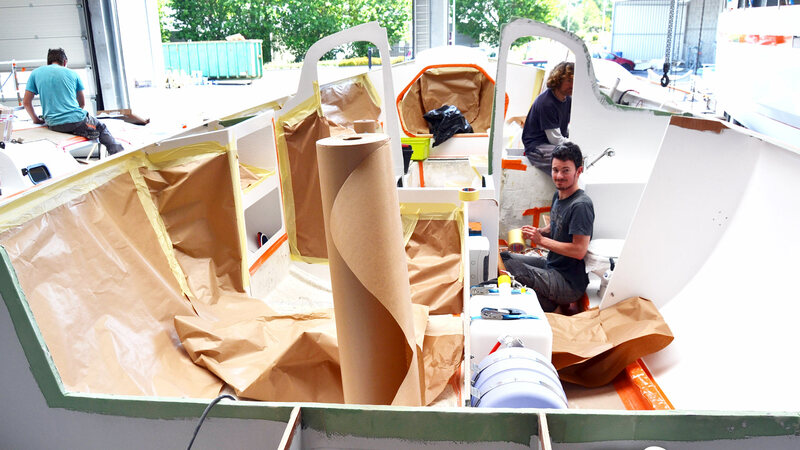 Boats are built only on request here at JPK Yachts and as Jean-Pierre tells me, currently there is a waiting time for one to two years (!) if you choose to getting a boat from Lorient. This small yard is working in shifts to ensure that clients receive their boats but there is virtually no crisis feasible here. 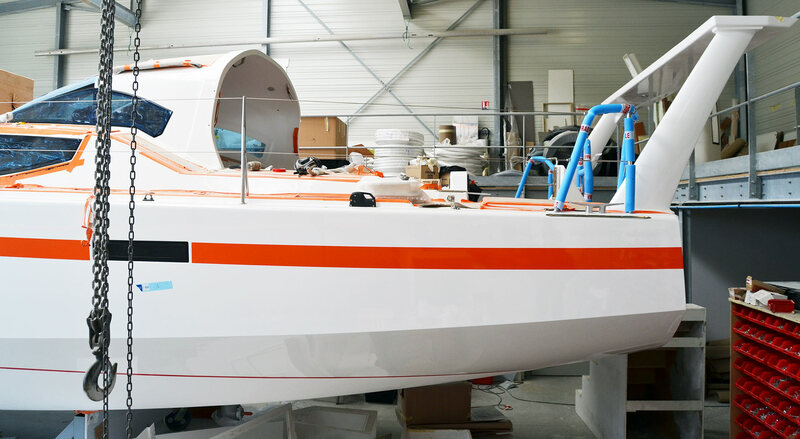 The high quality and the best performance of JPK yachts has created a very comfortable economic situation for the yard, so comfortable that Jean-Pierre tells me that they do not even have to attend boat shows nor run any advertising campaigns to market their products. It´s just word of mouth and the best reputation imaginable. JPK offers fast sailing boats starting at just under 10 metres length over all, followed by the fabulous JPK 10.80 (that has won the Sydney-Hobart Race in it´s class in 2016 and 2017), the 11.80 and the JPK 38 cruiser. And now there is the all new JPK 45, first introduced in 2016 and launched in 2017, which I am interested to see the most. 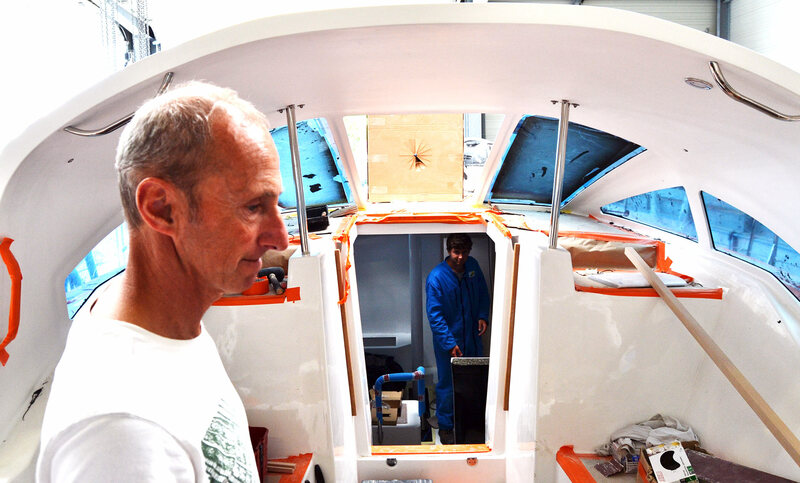 No matter which boat, all of them are made with the same care and love for detail, of this a client of Jean-Pierre can be sure. I have read much about the JPK 45 and seen some videos of this new cruiser and naturally this was the boat I was interested in to see the most. 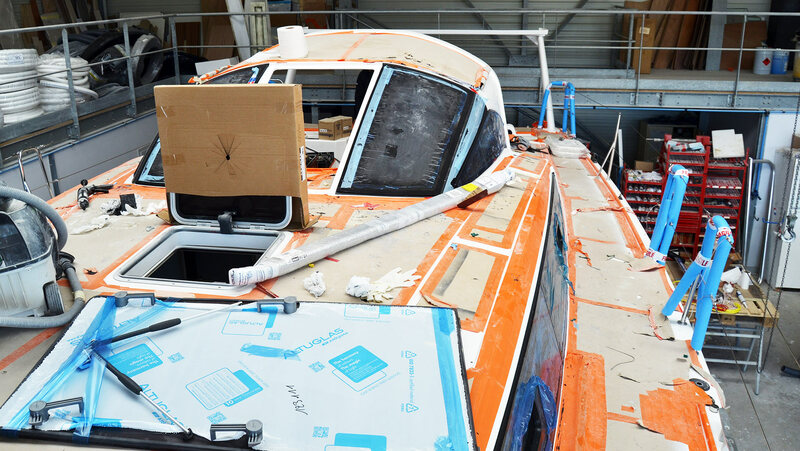 As we enter the big workshop where the boats are fitted after seeing the infusion-department and the workshop where the decks are made, I can spot the big boat among several smaller hulls at an instant: What a beauty! Unquestionably a French-style sailing yacht design! The JPK 45 is a big boat made for long distance – yet fast – cruising. With a length over all of 13.80 metres and a maximum beam of 4.50 this boat sports a wide aft stern planning capable hull. The bow is sharply edged but the bow section seems to be a bit more voluminous than the purely race-oriented boats of the JPK-line pointing towards a better upwind-sailing ability. Like all JPK-designs, the 45 is a no-frills-boat in every angle looking at it: It´s not a show-off by design (I guess, she will be a show off by performance). Clean lines, almost no decorative elements, just (in this particular case) a coloured stripe on the hull. I love the reduced and therefore confidence-instilling lines. There is a distinct chine running aft which I am sure will help this hull to plane with ease and make her fast. She sports a double rudder configuration steered by two wheels abaft. Lines are running covered all the way back in front of the wheels to two winches to either side of the boat. Arriving at the winch, the lines run through the clamps and right into a big, deep line-locker to prevent the cockpit from being flooded with endless burls of the lines. The layout of the cockpit is of such cleverness that this 45 footer is easily sailed by a single hand sailor. Walking over her deck to the bow I notice wide enough gangboards to either sides of the cabin coachroof. Even with the inner shrouds going up to the first pair of spreaders at the mast being ran inwards there won´t be any artistical bending all around them when sporting to the bow for the wide gangboard, which adds to safety for sure. I can count no less than five opening hatches which will make for sufficient ventilation and fresh air inside I think. The JPK 45 is a true blue water cruiser and therefore has a comparatively big deck superstructure which sets her apart from her sister boats at JPK. The large windows will make for a magnificent view of almost 300 degrees from inside and boost a light suffused interior – which is a major aspect of cruising for sure. I simple love the large dodger! As I am no friend of sprayhoods (either have protection or not!) at all, this solution is not only making a solid impression on me – it too has a very nice design that really adds to the overall look rather than interrupting or destroying it. As it is customary for a yacht this size meant to be cruising the oceans a rock solid aft equipment rack has to be mounted. With a JPK 45 this comes as a part of the basic installation and it too looks awesome. The upper part can be utilized to have solar panels mounted and of course all other stuff like antennae, GPS-receiver, Radar or other stuff. The rack is of such strength that it also functions as davits for a dinghy, which is a most important item for cruising people. I love this boat! Let´s have a more detailed look at the dodger again. It is nicely curved to provide for cover against waves, spray and cold winds for most part of the large cockpit. Two seats may be mounted directly on the seating benches under the dodger so that a watch in heavy weather is completely covered by the security of this dodger. 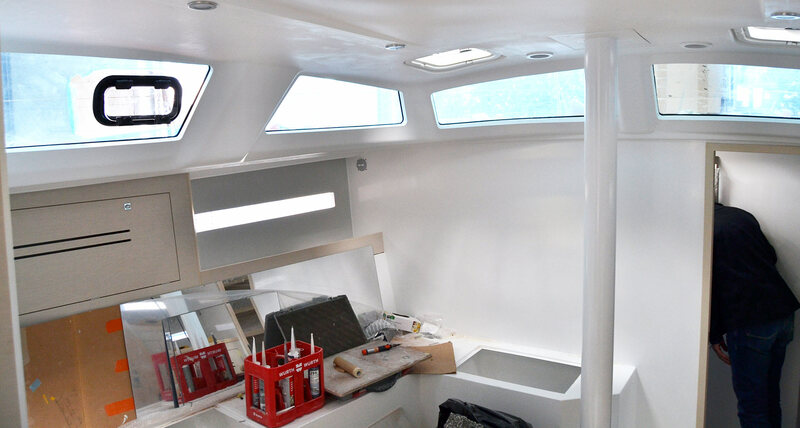 Large and rock solid windows provide for a full view to the bow, two LED-lights are installed in the ceiling of the dodger which I think is a great thing. 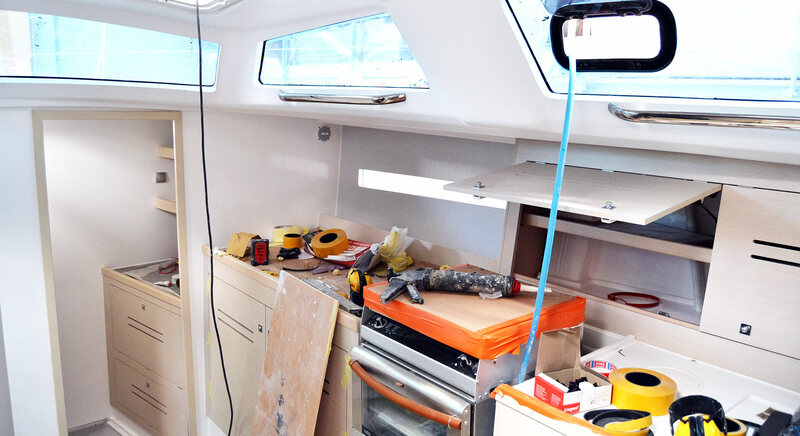 I notice no less than four grab handles mounted at the dodger´s edge which will provide for a safe standing position of skipper and crew in bad weather and heavy movements of the boats. Also additionally two thick stainless handles directly next to the entryway down will make the passage between cabin and cockpit way more safer. Jean-Pierre is seemingly proud of his new boat as he is showing me around and – a bit shy – answers “six”, right away when I asked how many boats of this tape had been built so far. That´s an amazing success for a yacht just recently launched and for a yard that small. As we enter downwards into the salon of the JPK 45 I am first of all stunned by the sheer light this yacht is suffused with. Indeed, the large windows in the coachroof are excellent in bringing lots of natural light to this area. For a 45-footer the internal layout of the salon is pleasantly NOT en-vogue with current design trends in yachting. Most boats sport large oversized salons with loads and loads of free space. Which is nice of course in ports but indeed is a waste of space (mostly at the expense of performance of the hull) and of course safety problem because large free room means no place to grab for a hold. That´s different with the JPK 45. To port side directly next to the entryway is the aft head. A large U-settee on the port side is adjoining, providing for a first safe grab upon entering salon. 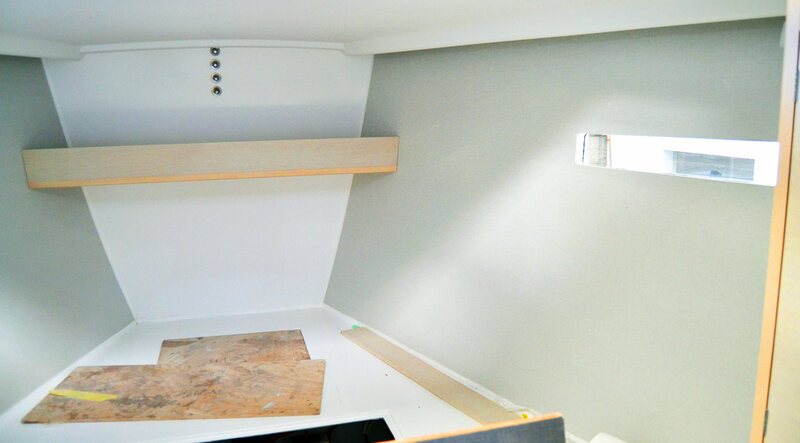 A nice dining table will be mounted here along with a central housing for the lifted swing keel. Starboard side sports a nice longitudinal galley, a configuration I normally do not like because I hate to be looking at the dishes when sitting in a salon, but I also see the point in having one: Large stowage, free movement all along the kitchen front, less space-consuming. I love the fact that the boat´s internals (as well for the outside) is over and over thoughtfully equipped with grab handles. And I am not talking of alibi-mounted stuff but of solid, thick, stainless steel handles which I trust can hold a full adult´s weight if needed when the boat suddenly may heel over in a gust. Everything about the JPK 45 is thoughtful and optimized for cruising. Have I mentioned that I find that these boats are refreshingly NOT aligned with current trends in yacht building? 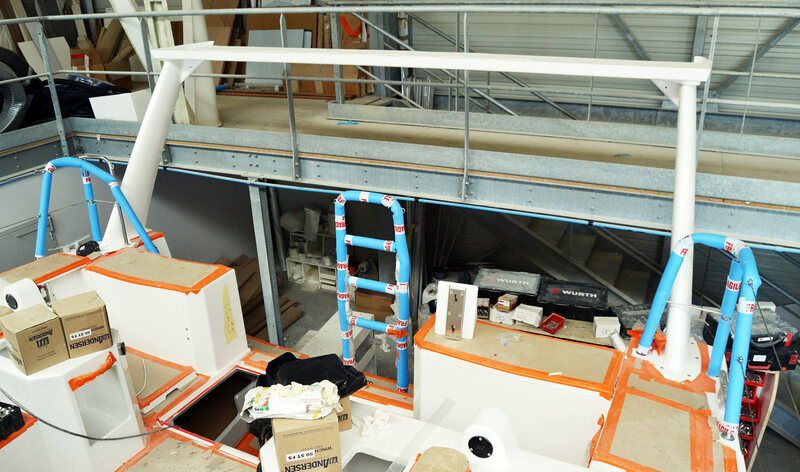 Rigid thick handrails everywhere – sailors at work here! The JPK 45 has just one single bathroom. Isn´t that cool? For the first time in so many years my prayers had been heard and here we are, finally, with a boat that does not waste it´s precious internal volume in having heads all over the place. Isn´t that a mess with large voluminous charter-optimized boats? Four cabins, four heads? You simply do not need it when family cruising! You need one bathroom – equipped with a toilet, a tap and a nice big shower. That´s it. Finally, upon seeing this, JPK had me! You see, I love the classic yachts of the Seventies and Eighties, like my own King´s Cruiser I am refitting right now. 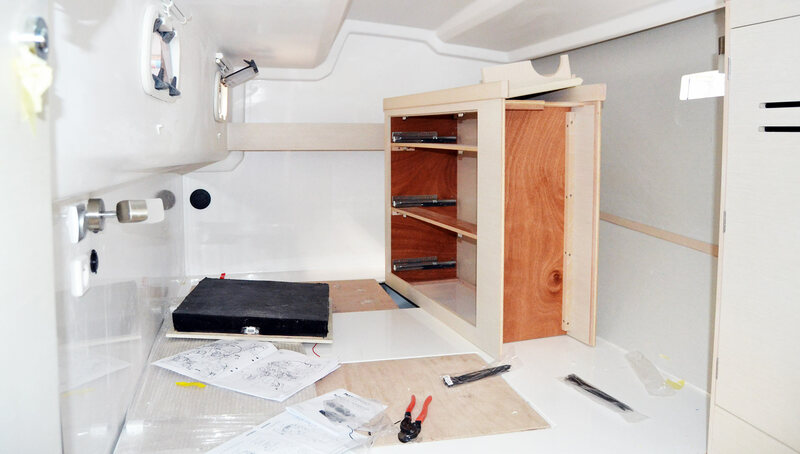 Lately my fore cabin has entered the final refit stage with all the Teak battens mounted, which looks awesome but, honestly, is a thing of the past. With JPK there can be no better antipode: The owner´s cabin (just as the other two aft cabins and the pullman cabin/stowage area) is a fine example of reduced design, of a form-follows-function-approach and the uncompromising charm of a JPK yacht. Here we simply have no mumbo-jumbo. Just a big bed and a shelf at the bulkhead (behind it is a large stowage area for sails, fenders and stuff, by the way). There are no decorative panels, no design-stuff and no bells-and-whistles. Just a different colour at the wall, that´s all. I think this is brilliant because – let´s be honest – who needs all this stuff? You will enter the cabin most of the time … tired. You want to undress and slip into your linens or sleeping bag to … sleep. 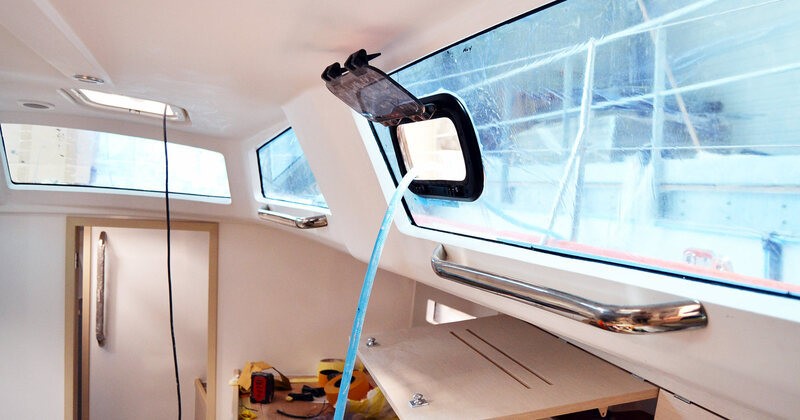 Indeed, it might be proving right to having nothing installed in the cabins because by having no double walls and ceiling all the condensed water can dry faster and can be removed faster. I like this no-frills-approach as it likewise forces you to focus on the things that really matter when being out to cruise: The cruising itself. Being out on the seas, experiencing weather, wind and waves. Even down below the focus it being reflected back onto you, onto the crew: It´s you, the humans who are sitting together at the dining table. It´s you that is counting, not a fancy interior with precious materials. I am sure that this boat will instill a certain behaviour into her crew when underway. 2 years on a waiting list for this beauty. It´s worth it! In the end, as I leave this fantastic JPK 45 I am really enthused and enthralled by this boat. She is radiating the wide world from every angle and I am sure she is a hell of a companion in bringing a couple or a number of friends safely and fast around. But there is more to her. I like Oysters too, for sure, but this boat is exactly the opposite of what the English counterpart may be: She is focused on sailing and on sailing alone. The comfort and the luxury of the JPK 45 lies in her true compassion for sailing and on immediately experiencing what sailing is about. She is not made for hosting nice sundowner-parties but for anchoring in remote bays and having a straight, honest evening dinner with your best friends who are keen sailors. No frills. As I leave the yard compound and shake Jean-Pierre´s hands for a Goodbye I am stunned and excited. When the guy who owns the JPK 10.80 back in my home marina was recommending to meet him here he was having this knowing smile in his face and said: “I cannot describe it, but go there, meet him …” Now I know what he meant and I can hardly hold back my enthusiasm and admiration for what Jean-Pierre and his dedicated, pleasant team are achieving day by day here in Lorient. 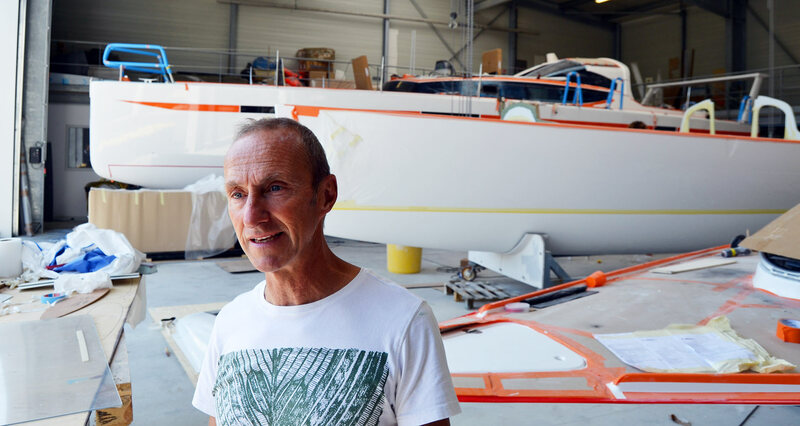 It must be a true joy for an owner-in-being to come here, talk to Jean-Pierre and plan his new boat. For sure, the two years waiting time for a JPK 45 will be a most exciting time because as we know it: Pleasant anticipation is the best of them all. And with a JPK yacht, for sure, everything that follows after receiving it will be even more exciting. Thanks Jean-Pierre for showing me around, it was a true exciting occasion!